Graphically stunning Dutch map of the Bible Lands. Orbis Per Creationem Institutus. / Orbis Per Diluvium De Stitutus. /Per Legem Constitutus. / Per Christum Restitutus. 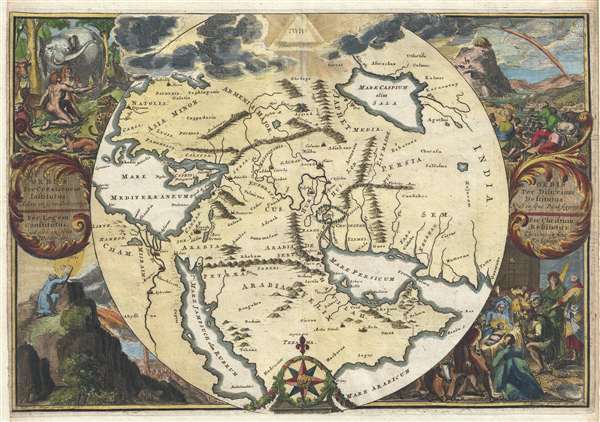 A remarkable 1705 map of the Biblical lands by Romeyln de Hooghe. Centered on Babylon, then thought to be the center of creation, the map extends from the Bosporus to the Arabian Sea and from the Nile valley to the Caspian Sea. It names important Biblical locations including, but not limited to, Jerusalem, Cairo, Memphis, Antioch, Aden, Damascus, Nineveh, Medina, and more. By far this map's most sticking feature is its extraordinary decorative surround. The map is surmounted by Tetragrammaton set in glowing pyramid. The Biblical scenes, from upper left, includes the Garden of Eden, Noah's Ark following the Deluge, Moses receiving the ten commandments, and the birth of Jesus Christ in a Bethlehem manger. This map was issued for Jacobus and Aleywn Basnage, T'groot waerelds tefereel, a richly illustrated Dutch prentbijbel published by Jacob Lindenberg, between 1705 and 1715. It was drawn and prepared by Romeyn de Hooghe. Romeyn de Hooghe (Septemer 10, 1645 – June 10, 1708) was a Dutch engraver, portrait artist, caricaturist, painter, and sculptor active in Amsterdam during the second half of the 17th century and opening years of the 18th century. De Hooghe was born in Amsterdam and revealed an early talent for all forms of visual arts. He became known caricaturist and is admired today as one of the first great graphic satirists. It his life he was criticized for his proclivity towards humorous tongue-in-cheek subjects. He nonetheless developed a following and produced a prolific amount of work, some 5000 engravings. He was a member of the Confrerie Pictura in 1662 and 1683. Cartographically he is best known for his decorative border work. His disciples were Filibert Bouttats (1654-after 1731), Filibertus Bouttats (1635–1707), Frans Decker, François Harrewijn, Jacobus Harrewijn, Aernout Naghtegael, Laurens Scherm, and Adriaen Schoonebeek. De Hooghe died in Haarlem on June 10 of 1708. Much of his work continued to be republished posthumously. Basnage, Jacobus and Aleywn, T'groot waerelds tefereel (Amsterdam: J. Lindenberg), 1705. Very good. Right and left margins extended. Original pressmark. Slight centerfold wear. Laor, E., Maps of the Holy Land: Cartobibliography of Printed Maps, 1475 - 1900, 341. Poortman, Wilco C., Kaarten in Bijbels, #154.